Perhaps the most controversial item on the agenda at Tuesday’s Artesia City Council meeting was the reclassification of municipal court bailiff. According to Sandi Farley, Human Resources director, having a sworn officer in the police department acting as municipal court bailiff would be the safest, albeit a more expensive, option. Farley said there are two-and-a-half months of salary savings from a clerical position that’s been vacant since July that could go toward the expense. Councilor Raul Rodriguez didn’t care for that idea. Councilor Nora Sanchez discussed the safety measures that should be considered. Police Chief Don Raley also commented on the safety issue. After a tense debate between council members, the council voted unanimously in favor of having a sworn officer acting as bailiff, and the motion carried. In other business Tuesday, the issue of recent burglaries in Artesia was brought up. The Artesia Police Department has been patrolling in unmarked vehicles around town since the beginning of the month and has apprehended four attempted burglars. 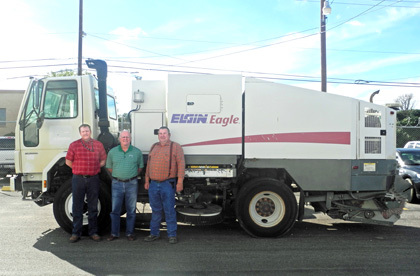 Also on Tuesday, the council approved the donation of a street sweeper to the Town of Hagerman and a resolution to accept the former National Guard armory building and property.